what games or applications you were using just two years ago and how they’ve evolved in that short span, the amount of time she has to take students from zero knowledge of coding to being able to build a responsive website or game. The program’s first year focuses on the foundations of programming, which has more to do with logic and planning than mathematics and electronics. Students learn the fundamentals by developing a computer game. arcade. Students also learn 3-D modeling for games and are introduced to mobile applications in the first year. Much of the program’s senior year focuses on website development using HTML in one of four development tools. Students also learn scripting languages, database basics, and how they interface with HTML so a developer can create an interactive dynamic website that fuels online businesses. “Web development is an important area for our students to learn because it is one of the most popular computer languages of the 21st century,” Hodge says. Senior Joshua Haskell of Jefferson says coding is surrounded by a mystique created through the media’s portrayal of a computer hacker operating out of his parent’s basement. In the real world, however, programs are developed in a cooperative environment, which Hodge fosters in her classroom/lab. “The level of communication between students is something I was not expecting,” observes Tyler Forward, who has already been accepted at Kent State-Ashtabula. He and Haskell comprise the program’s Web Design Team, which will represent the school at the SkillsUSA competition in May. Hodge says that at the competition, the students will be given five hours to complete a Web design project on their own. Hodge uses projects that previous teams faced as exercises to prepare the students for both the competition and future employment challenges. “Every day she whips out a new scenario for us to work on,” Forward says. By the time the final bell rings, the two-student teams have a website or application ready for her review. Because the field is so vast, students involved in competition focus on just one challenge, such as game development, demonstrating a trouble-shooting skill or leadership. The experience gives them an edge over students who enter post-secondary software development programs. Hodge says about 90 percent of the A-Tech program’s graduates head off to college or the military. She says students typically don’t find their area of focus until after they’ve completed their post-secondary studies and worked a job or two. Nicholas Leavitt, a 2012 A-Tech graduate, did not have to go far to find his job in the field. Leavitt works in A-Tech’s IT department, which is across the hall from both his former program and Computer Systems and Networking. Leavitt started out in a part-time position with the school and moved up the ladder when the assistant administrator position opened about 18 months ago. A technology student at Kent State UniversityAshtabula, Leavitt plans to complete his bachelor’s degree requirements in December, and then “I would like to stay here and work with the department,” says Leavitt, who sits on the program’s advisory committee. Hodge says she values the committee’s input because it ensures that what she teaches is relevant to the work done at local employers. “Most of the changes that have come about in this program are because of the ideas of the advisory committee,” Hodge says. The changes have been huge, says Brenda Angle, a 1972 graduate of the program’s predecessor, Data Processing. She has stayed involved with the school and the programs related to her field; she is employed at A. Louis Supply in Ashtabula in the accounting/data processing department. back then were mostly about computers and their history than programming them. Data was stored on punch cards, a business computer took up a whole room and the Internet hadn’t been invented. “It used to be that what you learned would be good for five or 10 years. Now, in a couple of days you have to learn something else,” she said. the field, he feels what he learned at A-Tech was much more pertinent and practical than courses he took in college. Cool hopes to grow My Cool Design to the point it can start hiring A-Tech web developers. He says Hodge “did a fantastic job” of preparing him for both a job and his role as entrepreneur, thus he gives back by serving on the advisory committee. “(Hodge) went above and beyond what most teachers do. She wanted to help me grow,” Cool said. 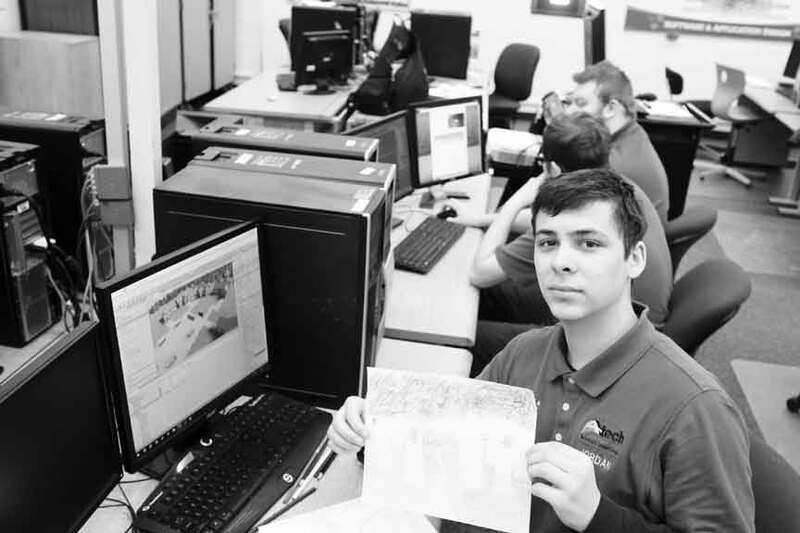 Jordan Buck, a senior in the Software & Application Design program at A-Tech, holds a drawing of a scene from a game he is developing. Students learn to develop applications and webpages by learning the steps that go into developing a computer game. Those same steps apply to many other computer-based projects.